This is a question asked by Brian from http://www.bjp.ie/ on our Facebook page. Getting into a daily, weekly, monthly system of SEO tasks. Also getting a template for organising link building management. 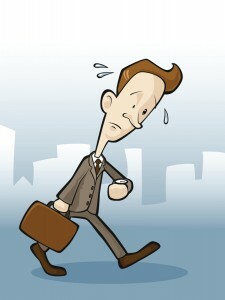 And lastly, wondering how much time should a small insurance broker invest in SEO we are totally new to the game. If you really want to profit from the investment you made in your website there is ongoing work that is never complete – here is a good guide to beginners SEO. The work is intensive at the start and then becomes a structured process that takes a minimum of 1 to 3 days per month. Therefore if you are doing all the work yourself be prepared for a couple of weeks of 12 hour days, this allows for normal day to day running of your business and the intensive SEO work for a short period to set up all the initial optimisation. Like so many business gurus I have heard say: you can’t get to where you are going if you don’t know where you are right now. Google analytics is free and measures the statistics for your website; this is a small piece of code that is added to your site. Google Webmaster Tools reports on the health of your site, once you have the analytics code installed you will have access to these reports. It is important to use the same Google login to setup analytics, webmaster tools, and any Adwords you are running; you will then be able to track conversions on your site from Adwords keywords and from organic keywords in search results. There are many niches in every business sector. When starting optimisation you need to know where you can win business, and at the same time have a view on the longer term goals. For example, I would not start a new site or a site that has not been optimised yet and target head keywords like “car insurance” – there are many smaller areas along the road to that term that can provide business. However, I would always be watching that longer-term goals are being met. Setting goals are part of competition and keyword research. 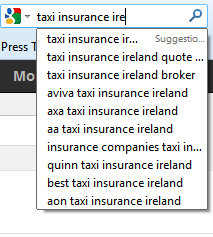 Enter your keywords, set the match type on the left to exact, the location to Ireland and search. Keyword research done right will take quite a while; it is the foundation of your site. This is the main keyword tool for Ireland, but look at all keyword sources: Google Trends, the auto suggest when you type in a search term and the competition’s sites. Don’t keyword stuff . This will kill your website and any ranking you have or hope to achieve. Continue this process for all the pages on your website; you can export the keywords from Google to spreadsheets. Titles and descriptions are only seen in the search results, not on the web page. They are part of the background code and every CMS should have the ability to hand edit these. If it doesn’t you need a different CMS. Use your main keywords in your title and try to structure it like a sentence. Titles built like these have better click through rates than just a list of keywords. Additionally just using a list of keywords can leave you open to Google penalties. The title and description need to be written for each page and be specific to that page: less than 67 characters, including spaces, for the title and less than 170 for the description. Include your keywords in your description, but remember the description is a call to action, a marketing text that real people read – so write it for them not Google. The above are the basics for setting up a website. It is unlikely to rank at this point for anything other than long tail keywords, not the words you are looking for the site to rank for. Rank checking is fairly easy. Depending on your needs you can use a free tool like the SEO Book rank checker, or the one I use Advanced Web Ranking – this does a lot more than just check rankings. Google Webmaster Tools will also list the keywords that your site is ranking for, with click through rates, position, and movement. Conversion tracking is import once you start to get traffic. Knowing which keywords convert to customers is important, this will lead to page conversion optimisation and split testing. These areas are expensive and time consuming for consultants and therefore sites normally have a reasonable amount of traffic before this is implanted in-depth. I believe it is a good idea for all companies to have a blog as part of their own site. It demonstrates openness and willingness of the company to engage with customers and just as importantly it is great for SEO. It is impossible to target all keywords with the pages on your website, writing blog posts allows you to target longer tail keywords and point clients to explanations of products. Link building is the most important task after a website is optimised. No website will gain much traffic without links from other websites. Link building is also one of the hardest tasks in SEO, especially for business websites where people are not inclined to link to them naturally. For small websites that have few inbound links the link building needs to be slow and steady, no more than 10 per month for the first few months. Using the wrong methods for link building will get your website penalised by Google, like the recent Google Penguin some of these penalties are very difficult or impossible to recover from. Once the SEO is set up correctly there is not a lot of ongoing time investment compared to other marketing channels like networking and PPC management, and it is much cheaper than conventional advertising. There is, however, a steep learning curve and a lot of upfront time investment. Referring back to the question, I don’t use a link building template as every site is different. Time investment if I was working on this type of site would be 1 day per month, but I would not be writing the blog posts – that really needs to be done in-house. As the business gains more from the website the time spent on the website will increase. Any thoughts? Let me know below.